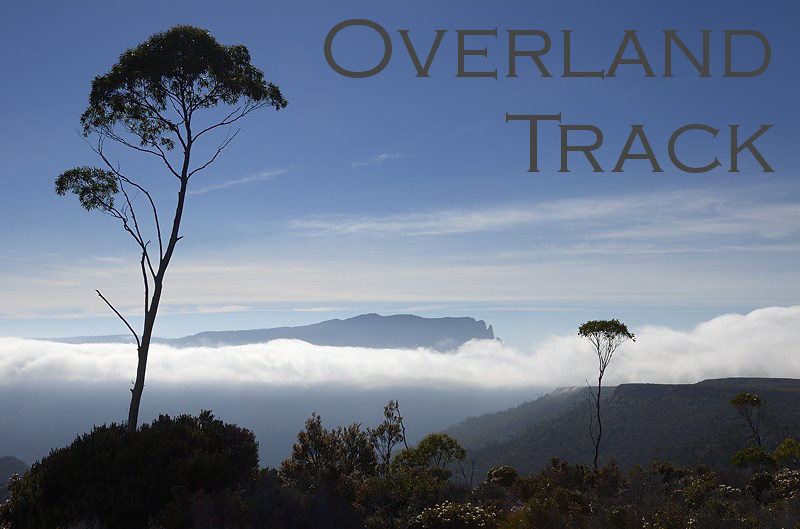 Having done two Overland Track walks with rain most of the time, and others with rain at times, I have gathered some knowledge of the things you can do to make your trip more enjoyable if it rains, and I have observed many people who would have enjoyed their walk more if they had planned a little better. Most people will get some rain, and some people will get rain every day. If the weather is really poor, heavy rain, wind and perhaps sleet, without it actually snowing, it will be more difficult to enjoy it, and you may in fact get most enjoyment and satisfaction just from managing to do the walk. Most people though will need to be prepared for somewhat wet weather that stops them climbing some or all of the mountains they wanted to get up, and requires some care to maximise enjoyment and minimise discomfort. Expect it to rain. The landscape wouldn’t look the same if it didn’t rain. Of course, we all hope for a fine sunny walk, but even in summer you will probably get some rain. In spring or autumn, it’s very likely and at worst it could rain for most or all of your trip. What will you do if that is the case? You might have travelled from the other side of the world to do this walk, and even if you live in Tasmania it will cost a fair bit to pay for your pass and organise transport. You’ve probably given up a week or so of time to get there, do the walk and get home again. Firstly I suggest that you expect rain, and in fact if it didn’t rain, it wouldn’t be entirely representative of the place. It rains a lot here. Secondly, make sure you are going to be comfortable in wet and cold weather, and be prepared to make the most of it. Don’t set yourself up to get cold and wet, then have to hibernate sadly in a hut rather than doing the things that can be done safely in the rain. drizzles, with a hint of morning sun. Thirdly, you will find it easier if you just enjoy BEING THERE. It really is a beautiful place, and the wildness is even more obvious in poor weather. This is a place you could die of exposure, get lost, or fall off something high, and it is deserving of respect. If it rains a lot on your walk, you will need to get over it and enjoy the fact that you are not stuck in the office, or a traffic jam, or your house. You are out there getting fit and gathering new experiences. 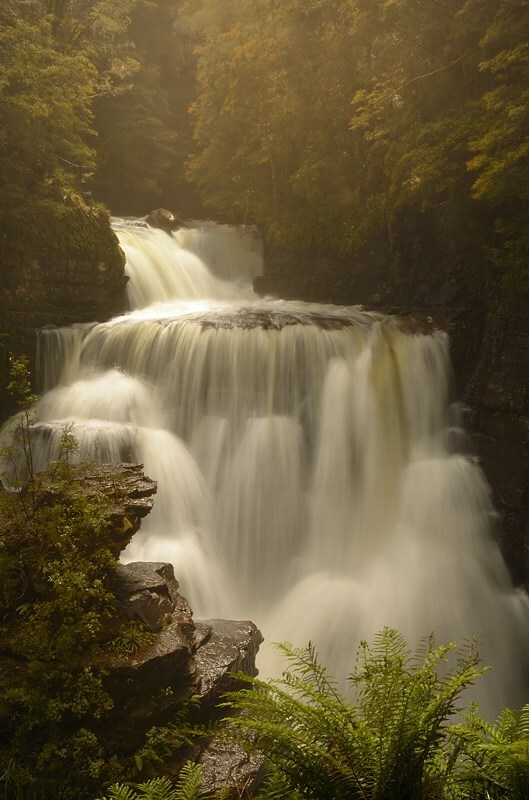 Finally here, remember that when it’s too wet for climbing mountains, the waterfalls are at their best. 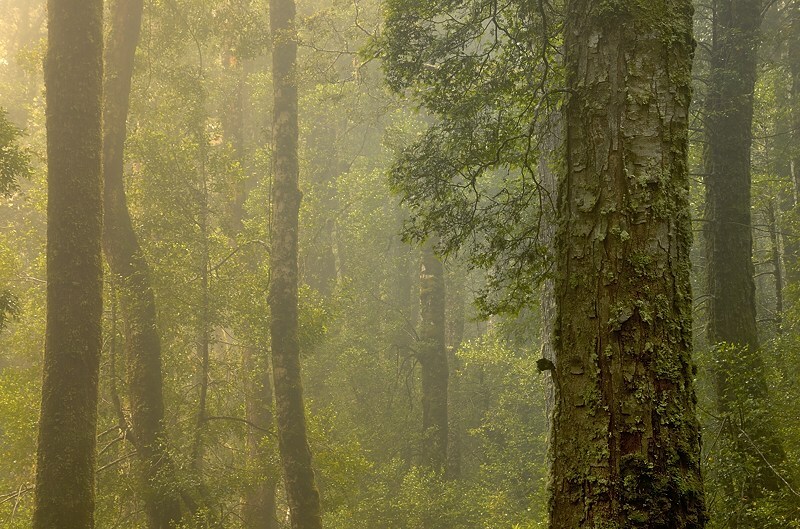 Wet weather can also improve the appearance of some of the forests. Of all your gear, this will be the most important if it’s wet. The tent comes second, and is almost as important. Make sure your coat keeps the wind and rain out. You will still get damp, as some water will come in round the edges, and you will sweat up the hills. Breathable coats are much better, but you will still usually get damp in them. If your raincoat is inadequate, you are going to keep arriving at overnight stops being cold and uncomfortable, you will absolutely be hurrying between huts and will miss sights and opportunities along the way, and you will tend to hide in the hut rather than doing anything else once you get there. My firm view is that the longer raincoat styles are best – those trendy ones that come down just past your waist may look good in Salamanca, but they’re not good at keeping horizontal sleet out of your drawers. The heavy three-layer ones are best too – the thin ones tend to die under pack straps and from being abraded by the Tasmanian bush. And do I need to say it? If you shop at Anaconda or Kathmandu without careful discernment as to brands and suitability (or when there isn’t a sale), you deserve to get wet. You may also find items like over-trousers and waterproof mitts are useful for extended wet walks. I like having the mitts, as gloves get wet very quickly, and wet gloves get old very quickly. You may just have something like waterproof ski gloves, but I like some thin ones I can use the camera with. Tents with two water-resistant layers are best. (Plug here) I have Macpacs, and find that their outers are very waterproof, and their inners will stop much of the condensation, so that drips will run down the inner rather than coming through. Some mesh inners clearly are not very good once water starts to condense on the inside of the tent outer, and if anyone touches the tent walls, mesh inners are very water absorbent. Many cheaper tents are just not good in the rain, and I’m not sure why people bother with them. An additional benefit of the Macpacs is their multi-pitch ability – you pitch the fly and the inner together, or the fly and then the inner. You can take the inner out and pack it beneath the still standing outer, thus minimising the rain that gets on it. I presume there are other brands that also provide this capacity. Think about this carefully, tents get wet when being pitched and packed up. Your tent will be vital if huts are full, which is more likely when it’s raining, because many other people on the track either have no tent or a tent which is crappy in the wet. In addition, when the huts are busy, the ability to slope off to your tent for a nap during the afternoon rainstorm is very welcome. Of course, you are supposed to carry a tent that you can use if you are unable to reach the next standard campsite. I've met many people who wanted to do this – either they wanted to continue further, but not the whole way to the next hut, or they found a day hard going and wanted to stop early. Both of these reasons tend to lead to people camping at Frog Flats, and there are various other obvious places for camping, even if they’re not all marked on the maps. If you don’t even carry a tent, this won’t be an option. An emergency could see you relying on others for your survival. You must make sure your sleeping bag and spare clothes stay dry. In Tasmania it is a rule that you should not rely on backpacks alone for this. Your sleeping bag should be in its own waterproof bag. I just use a waterproof compression sack for mine. Then I also have a pack inner which basically keeps everything dry, guaranteed. This can double as either a ¾ bivvy, a small groundsheet for sitting on and a separate sack for carting gear around. I note that some people use pack covers. These seem popular, so they must work OK, although I’m suspecting that my pack would admit water through what must be a multitude of seams and joints relating to the harness. As a rule, you need a set of clothes that are guaranteed to stay dry. This will be at least thermals - top and bottom - and possibly jumper and socks. You need to avoid using these clothes just because yesterday your walking clothes got damp. If you haven’t been able to dry everything, too bad, put it on and get walking. Your body heat will dry it, or at least warm up the water. As long as you can keep the wind out, it’s a bit like wearing a wetsuit. Your dry clothes never get wet – if you have to go to the loo in pouring rain, you may need to change them. Make it a rule. Once you have got wet and cold, as soon as you arrive at a hut or campsite, you will start to cool off. You may rapidly find yourself too chilly. You need to put dry clothing on, you may need to get in your sleeping bag, put your hat on etc. You should make yourself a warm drink – I reckon Milo is best, but weak milky tea is good. You should eat some food. Busy huts will quickly warm up, but if there are just one or two of you, sometimes your tent will actually be warmer. In huts with coal stoves you can light the stove. I gather the gas stoves are tied to the temperature, and won’t even light until the temperature falls below 10°. However, if it’s 12°, you’re damp and chilly, and you have a coal stove handy, you may decide that’s a rule that ought to be broken. When it’s raining, socialising in the huts can be the best form of entertainment. 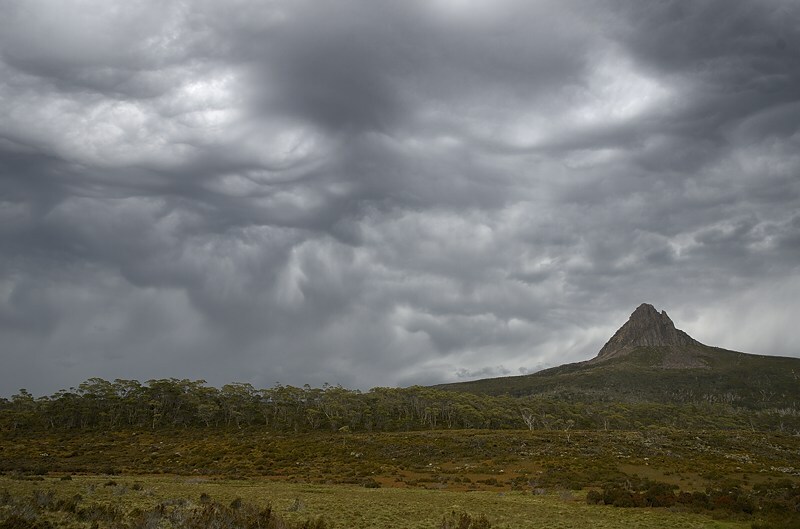 You will meet a strange mix of people, from media stars to penniless (and virtually foodless) backpackers, from senior politicians to hairy weirdos from somewhere in deepest Tasmania. You can find out all sorts of things about the track, other walks in Tasmania and well beyond, other places, other people’s jobs and so on. Even when it's not raining, you will probably find yourself travelling along the track with the same group of people each day and night, so it can be worth getting to know them a little. There are often things you can do for each other. One person has a pair of scissors, another has string, one has a needle and thread, another has the pliers needed to use the needle to sew up a pack or a boot. Need something, just ask. You will benefit from being able to light a fire. Apparently most of the coal stoves have now been removed. This will no doubt mean some huts are colder. If you find a hut with coal, good luck. They’re great once you’ve got them going. There are instructions in the huts, but they can be finicky. You really do need to get a good little blaze going in some wood kindling. Make sure there’s enough and always collect a load for the next group who come along and need to light a fire. Make sure you have some dry paper or a fire lighter. Paper is fine. I used my bus booking confirmation from the Launceston to Cradle leg, but track notes for the earlier part of the walk will also work fine. I did find that printer/copier paper wasn’t completely dry when I came to use it. I think carefully dried and protected newspaper or even clothes-dryer lint might have been better. Make sure you empty the ash drawer – if this clogs up the fire starts to work less well, and you won’t be able to properly control it to a low heat. Make sure you have and use small pieces of coal at first, they really do catch quicker. Make sure you keep it going once you’ve started it – otherwise you’re back to square one. Finally, don’t use them when it’s not necessary. When it’s raining and you’re stuck in the hut, I suggest that you get out and about anyway. Sometimes your hut mates will be such that you are really keen to do this. There are various places near most huts that are worth a look. You can just wander along the track and check out the vegetation, even in the rain. Obviously a raincoat is going to be useful for this. Basically, I find it enjoyable to stroll about near the huts when it’s not raining too hard, seeing which plants I can identify. A camera is useful too – even when it’s raining there are things you can photograph. Great Post! It makes walking in the rain look pretty good. I've really enjoyed this blog. Thanks David. Yes, I think walking in the rain can be quite enjoyable, as long as you're prepared for it. Great advice Mark - lots of useful hints. I really like the fact you focus on making sure you ENJOY the walk and expect to get wet. All about mindset. Awesome post and great advices! I'm wondering, what sort of camera did you take to get such beautiful pictures, considering you need to be mindful about weight and space on the trip? Hi Caroline. Thanks for your comments. I always carry an SLR. Sometimes an extra lens and medium-sized tripod. Weight is problematic, especially on a longer walk that requires full foul weather gear too. To minimise weight and maximise quality I suggest you look at good mirrorless cameras. The Nikon 1 seems good, and there's a waterproof one. There are sveral similar sized cameras, and Olympus seem to have some great ones too. For me, the quality of the lens and sensor are important, and then the capacity to capture a RAW image, which I can edit properly. Some of the results are only achieved in software. That is, I admit, they are "photoshopped" to overcome the limitations of the situation. Having a RAW file makes editing much easier, for example when you've taken a photo of a watefall in a dim foggy gorge in the rain. You also need to know how to get the camera to capture the image you need to make the picture you're imagining. Some training courses are useful. Good luck! Thanks Mark for your answer, very useful!